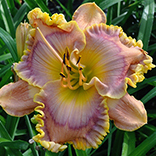 MEXICAN ELVIS (D. Trimmer) Tetraploid (Carol Todd x Sdlg.) 27” M. Re. Ev. 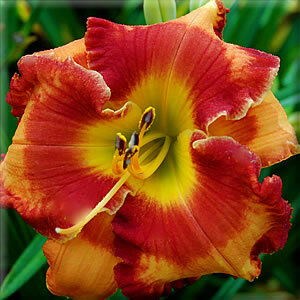 6” MEXICAN ELVIS is another orange garden standout with a shout-out red and orange Spanish flair. I wanted a “flashy” name for this bright orange and red flower. Somebody in the garden suggested “Mexican Elvis” I was sold on the name. This Elvis has about twenty buds on four lateral branches topped by a terminal Y. He has a deep red eye and large red edge surrounding the pale orange base color. MEXICAN ELVIS is striking and flamboyant! Fertile for sure both ways.